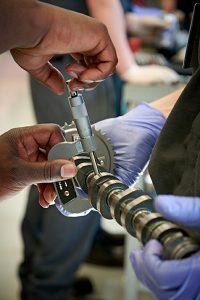 Master the Ford ASSET program, GM ASEP program, Honda PACT program or Toyota T-TEN program at Ranken Technical College. Does a career in the automotive industry sound right for you? Do you love working on certain car brands, like Ford, Lexus or Toyota? Are you excited about working with the latest technology and facing new challenges every day? Do you have high standards and the desire to prove yourself on the job, earning a paycheck while you complete your degree? If this sounds like you, one of Ranken’s Certified Dealership Technician Programs could be the path to a successful and rewarding career. You’ll train on the tools, equipment and vehicles that the dealership has, making you career-ready for the dealership service environment. Ready to get started? Complete the form below, and we’ll respond as quickly as possible to answer your questions and guide you through the application process. Why choose Ranken for brand-specific training? We provide you with brand-specific skills to give you a competitive advantage in the job market. Our training is offered through partnerships we have with four of the most popular manufacturers, including the Ford ASSET program, GM ASEP program, and our Automotive Import Technology track, which combines the Honda PACT program and Toyota T-TEN program. According to the Bureau of Labor Statistics, some employers report difficulty finding workers with the right skills. Ranken’s Certified Dealership Technician Programs provides students with brand-specific instruction, giving graduates a competitive advantage when seeking employment in the industry. All four dealer specific programs are accredited individually by the Automotive Service Excellence (ASE) Education Foundation (formerly NATEF), an industry benchmark of automotive certification. Students in the Automotive Import Technology program choose to focus on either the Honda PACT program or the Toyota T-TEN program. They get real-world experience by working in a paid internship at a sponsoring dealership. The program schedule alternates between eight weeks of instruction, followed by eight weeks of field work over the four-semester program. The Ford Automotive Student Service Education Training (ASSET) Program is a two-year Technical Career Entry Program (TCEP) where students will receive an Associate’s Degree in Automotive Technology upon graduation. The Ford ASSET program offers an in dealership co-op. This means that students will receive a paid internship while enrolled in this program. Students will rotate between Ranken and the dealer internship every 8 weeks, giving them valuable hands-on experience while they learn. While attending Ranken students will also receive Ford Service Technician Specialty Training (STST) on all Ford and Lincoln vehicle systems. Completion of Ford STST earns students the valuable certifications from Ford Motor Company that are required to perform work in the dealership. The GM ASEP program is designed to prepare students to pursue careers in servicing and maintaining General Motors (GM) vehicles at Buick, Cadillac, Chevrolet or GMC dealerships. 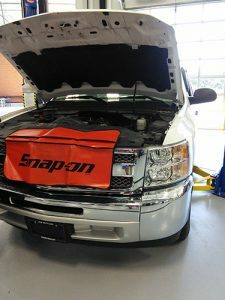 Program courses are based on the General Motors (GM) Automotive Service Educational Program (ASEP), which provides GM-specific training initiatives to assist GM dealers in educating their next generation of technicians. Participating GM ASEP program students alternate between blocks of eight weeks of instruction at Ranken and eight weeks of hands-on work in an internship at a sponsoring dealership. This real-world experience gives students the opportunity to work with the same tools and equipment as the service facility technicians. At the end of the five-semester program, students will have completed thirty-two weeks of internship experience, giving them the experience they need to succeed.